Canadian/French/Moroccan photographer and performer 2Fik considers himself a stateless person; his work is a self-described “soap opera” of mashed-up cultures, in which he plays all the roles, darting and weaving through questions of identity. His newest exhibition, “2Fik’s Museum” (through May 18 at The Invisible Dog in Brooklyn), is a collection of photos that feature the artist in re-creations of some of European art history’s best-known works. As we imagine that we were there, we might send melodious birthday greetings to Edward Kennedy “Duke” Ellington; he was born on this date in 1899. A composer, pianist, and bandleader, Ellington composed over 1,000 works. And while he created and performed in genres that ranged from blues and gospel to film scores and classical, he is best remembered a titan of jazz (though Ellington himself much preferred the label “American music”). 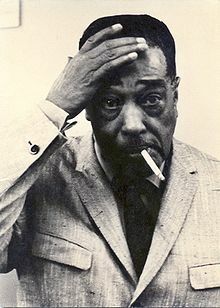 Ellington was recommended by the judges panel for the Pulitzer Prize in Music in 1965, but was denied it by the Board. In 1999, after his death, the Pulitzer Board awarded him a special posthumous prize. In the century since his birth, there has been no greater composer, American or otherwise, than Edward Kennedy Ellington.